Due to the introduction of the operating microscope, modern aneurysm clips, the concept of early surgery and a more refined intensive care management, the prognosis of patients with ruptured intracranial aneurysms has improved substantially. Nevertheless, neuropsychological studies show a marked discrepancy between a good neurological result according to the Glasgow Outcome Scale (GOS = I) and the cognitive and psychosocial functional level of the patients surviving SAH. 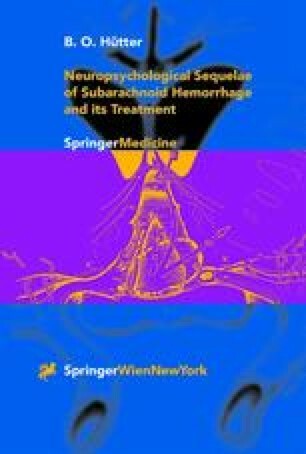 Surprisingly, no differences between the impairments of operated patients and those having sustained spontaneous non-traumatic SAH without a proven source of the bleeding could be demonstrated.